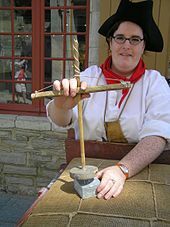 A bow drill is a simple rotational hand-operated tool of prehistoric origin. As a "fire drill" it commonly was used to generate friction to start a fire. With time it was adapted to woodworking and other tasks requiring drilling, such as dentistry. Bow drills were used in Mehrgarh between the 4th and 5th millennium BC. This bow drill—used to drill holes into lapis lazuli and carnelian—was made of green jasper. Similar drills were found in other parts of the Indus Valley Civilization and Iran one millennium later. The bow drill consists of a bearing block or handhold, a spindle or drill, a hearth or fireboard, and a simple bow. Other early versions of mechanical drills include the pump drill and the hand drill. The drill offers an ancient method of starting fire without matches or a lighter, a method that applies friction to generate heat. The heat eventually produces an ember in the burnt sawdust. The ember is tiny, smaller than the head of a cigarette, and fragile. Once the ember is formed it is carefully placed into a "tinder bundle" (a bird's type nest of stringy, fluffy, and combustible material). Once the ember is in the tinder bundle it is then carefully nurtured and coaxed into flame. Once the tinder bundle bursts into flame, it is placed into the fuel that has been assembled ready for ignition. 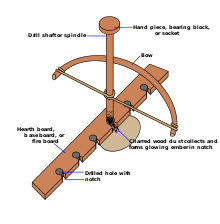 The spindle, carved to reduce friction at one end and maximize it at the other, is held in a hole in the bottom of the bearing block, and at the other by the base board (which also is known variously as the hearth, hearth board, or fireboard). The string of the bow is wrapped once around it, so that it is tight enough not to slip during operation. A variation on this is called the Egyptian Bow Drill. It attaches the string by wrapping it around multiple times, or actually tying it to the drill or through a hole through the drill shaft, then wrapping it. The usual position that a person assumes whilst operating the bow drill is as follows: the right knee is placed on the ground (assuming a right-handed operator) and the arch of the left foot is on the board, pinning it in place. The left wrist, holding the handhold, is hooked around the left shin and locked in place to keep it steady so it can generate enough downward pressure and speed; achieved by pushing down with the handhold and spinning the drill. The heat of the friction between the hearth and the spindle both creates charred, fuzzy dust and causes it to ignite - forming a coal or ember. The handhold is lubricated and the spindle is carved to about thumb thickness, usually 150 to 250 millimetres (6 to 10 in) long. Another option to practice is to make the "handhold" into a "mouth-hold" piece, so it's held down by pressure from the chin/mouth, leaving both hands free. An indentation and a "v" notch into the center of the dent is made into the fireboard and the spindle is placed on it. The notch allows a place for the dust collect while it is being abraded off the spindle and the hearth. Eventually, the friction generates heat to ignite the dust, which can be used to light tinder. Other methods of include drilling part-way into a hearth made by lashing two sticks together from one side, and then drilling from the other side to meet this hole; or using the area where two branches separate. This is to keep the coal off wet or snow-covered ground. A pump drill is a simple tool used to make holes in light materials by hand and has been in use for centuries. The drill itself is composed of: the drill shaft, a narrow board with a hole through the center, a weight (usually a heavy disc) acting as a flywheel, and a length of cord. The weight is attached near the bottom of the shaft and the hole board is slipped over the top. The cordage is run through a hole near the top of the shaft and affixed to either end of the hole board so that it hangs just above the weight. The end of the shaft usually has a square hole made to fit certain sized auger bits or a simple triangular bit made to cut while rotating in both directions. To use, one hand is placed on the hole board while the other turns the shaft to wind the cord around its length, thus raising the hole board to near the top where the cord becomes taut. Placing the tip against the material to be drilled and held upright, a smooth downward pressure is exerted on the board, causing the drill to rapidly spin. Once the bottom is reached, the weight is relieved and the drill allowed to rebound re-winding the cord around the shaft and the process is repeated. It is a skill simple in concept, but takes some practice to master and greatly speeds up the process of making small holes. A hand drill with a hearthboard. The strap drill is similar to the bow drill but has no bow. The socket piece is shaped to be held well by the mouth, so that both hands may be free. The strap is held between one hand and the other, and wrapped around the spindle, such that rapidly moving the hands left and right spins the spindle to create friction with the fire board as in the other techniques. ^ a b Frederick Webb Hodge (1 July 2003). Handbook of American Indians North of Mexico V. 1/4. Digital Scanning Inc. pp. 402–. ISBN 978-1-58218-748-8. ^ Roger Bradley Ulrich (2007). Roman Woodworking. Yale University Press. pp. 30–. ISBN 0-300-10341-7. ^ Nisha Garg; Amit Garg (30 December 2012). Textbook of Operative Dentistry. JP Medical Ltd. pp. 103–. ISBN 978-93-5025-939-9. ^ a b c Kulke, Hermann & Rothermund, Dietmar (2004). A History of India. Routledge. 22. ISBN 0-415-32920-5.